“We are living in the middle of the largest increase in expressive capacity in the history of the human race,” declared Clay Shirky in his 2008 tome Here Comes Everybody: The Power of Organizing without Organizations (Shirky, 2008). In the intervening years we have continued to see an emphasis in curricular thought and reform which seeks to realize the potential of a dawning Digital Age. In blog posts and cable news investigations, parent-advisory council meetings and teacher professional development events, academic scholarship and TED Talk distillations, discussions about curriculum struggle toward consensus on what might constitute an education for the 21st Century. Such a time is fraught with both possibility and peril. “Information is an integral part of daily life in today’s society in order for individuals to survive against information-related requirements. Production of knowledge requires different skills than those necessary for producing goods. Thus, the concept of shock could be interpreted partly as the feelings of the confusions of people, being aware of not having necessary skills for the new literacies” (p. 127). Looking toward the unique challenges presented by the Digital Age, David Perry recommends taking “note of the plasticity of digital forms and the way in which they point toward a new way of working with representation and mediation, that might be called the digital ‘folding’ of reality, whereby one is able to approach culture in a radically new way” (Perry, 2011). As this ‘folding’ of reality administers structural changes across society, curricular reform lies at the center of digital reinventions of politics, economics, creative expression and collaboration, the natural sciences and perspectives on the nature of life and consciousness itself. However, such broad educational considerations are hardly novel, as Egan noted in 1978 that once started down the path of inquiry into the methodology of education, “there becomes little of educational relevance that can be excluded from the curriculum field” (Egan, 1978). Thus, the regeneration of our curricula to suit the Digital Age is something that ought be carefully engaged to ensure an authentic expression of society’s best intentions for education. “The progressive emphasizes the importance of studying the child to find out what kinds of interests he has, what problems he encounters, what purposes he has in mind. “The essentialist, on the other hand, is impressed by the large body of knowledge collected over many thousands of years, the so-called cultural heritage, and emphasizes this as the primary source for deriving objectives. “[Sociologists] view the school as the agency for helping young people to deal effectively with the critical problems of contemporary life. If they can determine what these contemporary problems are then the objectives of the school are to provide those knowledges, skills, attitudes and the like that will help people deal intelligently with these contemporary problems. This paper seeks to examine the Government of British Columbia’s Education Plan (BCEdPlan) from each of these perspectives with the hopes of furthering discussion of the potential of curricular reform in the Digital Age within the province. “While a solid knowledge base in the basic skills will be maintained,” the BCEdPlan admits that better preparing students for the future will require greater emphasis on teaching “key competencies like self-reliance, critical thinking, inquiry, creativity, problem solving, innovation, teamwork and collaboration, cross-cultural understanding, and technological literacy” (p. 4). At the time of this writing, the Ministry of Education has begun posting draft versions of subject and grade curricula from grades kindergarten to nine. The intent of this section of the paper is to investigate the formally published BCEdPlan with the hope that this discussion might lead to a similarly critical analysis of subject curriculum as it comes more clearly into focus. 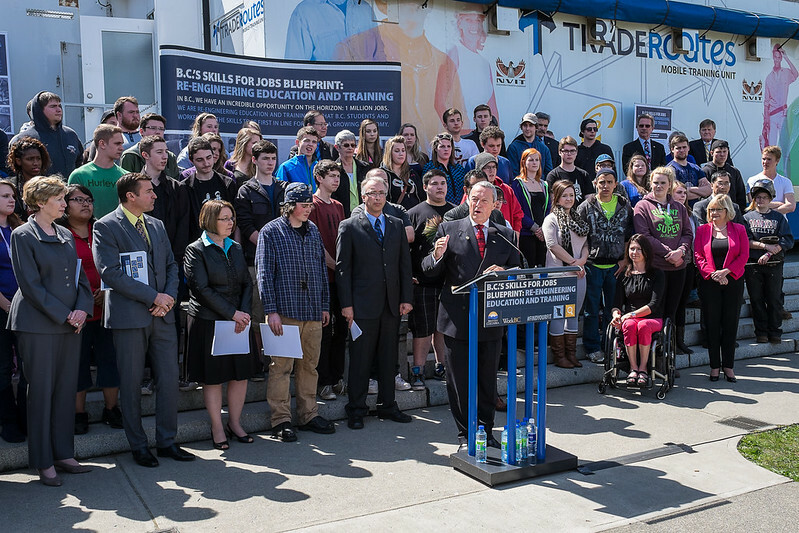 In its advocacy on behalf of student choice and flexibility, the BCEdPlan may be seen to embrace tenants of the progressive mindset. By looking to develop students’ passions, self-reliance, and personalizing the learning experience of each individual, the focus on role of the child in the schooling process is soundly rooted in progressive principles. Essentialists, meanwhile, may not see their approach as integral to the BCEdPlan, which cites as an operating premise the idea that “The world has changed and it will continue to change, so the way we educate students needs to continually adapt” (p. 5). The impetus for the education revolution in British Columbia and other jurisdictions around the world is an acknowledgement that the Digital Age has so fundamentally changed the nature of society that new skills and knowledge(s) are required for tomorrow’s citizens. And while it may include traditional values and legacies such as cross-cultural understandings and assurances that core knowledge and “basic skills” such as literacy and math will be preserved, the BCEdPlan looks to create and define new skills and proficiencies – e.g. “innovation” and “creativity” – which essentialists may view as components of a much lengthier cultural heritage. For example, the essentialist may view the advent of new communications technology as an opportunity to apply the lessons of past revolutions in reproduction and collaboration to contemporary curriculum. Providing an education in the background of the relationships between advances in technology and human creativity, for instance, could prove a valuable instructor for young people learning about literacy in the Digital Age. Bruner describes undertaking such a task as learning about “not only the role of tools or language in the emergence of man, but as a necessary precondition for doing so, setting forth the fundamentals of linguistics of the theory of tools” (Bruner, 1966). It remains to be seen the amount of influence these and other cultural legacies will exert in the pending British Columbia curricula, however the tenor and intent of the BCEdPlan as stated casts its gaze decidedly toward the future, potentially at the expense of the vast cultural learning about the past. A Stronger Partnership with Industry and Labour to Deliver Training and Apprenticeships to “better connect [students] with the on-the-job and classroom training [needed] to boost […] skills or achieve certification” (p. 8). Sociologists may be encouraged by the consideration of such economic metrics to guide the creation of British Columbian curriculum. However, by viewing the BCEdPlan as embedded within the government’s more comprehensive BCJobsPlan, they might find the purview of this sociological study to be narrowly focused or to ignore altogether areas of potentially more pressing contemporary importance. “To make the most effective use of our education and training resources,” the BCJobsPlan notes, “we will rely on the best data and […] the most up-to-date labour market information […] to guide government decision-making and to determine spending priorities” (p. 7). Further sociological study may seek to critically address 21st century problems such as inequality, environmental degradation, or the degree to which our education systems help actualize the democratic ideals enshrined in the Canadian Charter of Rights and Freedoms (Canada, 1982) or Multiculturalism Act (Canada, 1988). “That the apprehension of the phenomena of the physical, social, cultural world is through constructed and constitutive acts, not mechanistic or naturalistic realist representations of pre-existing or self-evident information” (par. 7). Educational philosophers may be critical of the BCEdPlan’s reliance on “the best data and labour market projections” to direct educational resources at the expense of allowing a more broadly constructed view of education’s role in democracy into the decision-making process, as this data assumes a market-oriented solution to a perceived educative problem. Others may highlight the similarity between this practice and the economic project authored by Milton Friedman in the form of neoliberal capitalism, “the doctrine that market exchange is an ethic in itself, capable of acting as a guide for all human action” (Harvey, 2005). The educational philosopher may also challenge the symbolic representation and meta-messages about the nature or purpose of education communicated in the language and design of schooling, as Giroux has noted that the “survival-of-the-fittest ethic has replaced any reasonable notion of solidarity, social responsibility and compassion for the other” (Giroux, 2012). Analyzed through these various perspectives, the creation of 21st century curriculum in British Columbia can be seen to highlight aspects of both the progressive and sociological perspectives. While each of these lenses could be explored further, a more comprehensive approach to addressing essentialist and philosophical concerns would allow a more broadly constructed view of curriculum in the Digital Age. In implementing its notion of 21st century learning, the government of British Columbia should be especially willing to experiment with new technology in developing a curriculum reflective of the digital medium’s message (McLuhan & Fiore, 1967), lest our collective aspirations for the future be limited unnecessarily by perceived economic realities. Paulo Freire described a similar sense of enlightenment at the root of an emancipatory critical praxis, whereby “critical percep­tion is embodied in action, [and] a climate of hope and confidence devel­ops which leads men to attempt to overcome the limit-situations” (Freire, 1970). This emancipation constitutes an active citizenship that continues to transform reality, “and as these situations are superseded, new ones will appear, which in turn will evoke new limit-acts” (p. 99). By applying such critical discourses to the negotiation and expression of societal interests with respect to curriculum, we are presented with one of the unique democratic opportunities presented by the Digital Age itself. Indeed, as Simsek and Simsek point out, “the free flow of information through new technologies is consistent with the requirements of deliberative democracy.” However, as the man largely credited with the developing the World Wide Web, Tim Berniers-Lee, recently noted, “Unless we have an open, neutral internet […] we can’t have open government, good democracy, good healthcare, connected communities and diversity of culture” (Kiss, 2014). As the Ministry of Education continues to unveil its vision for the future of education in British Columbia, these and other questions, perspectives and concerns raised in the discussion of this paper are presented with the intention of further engaging an ongoing discussion of curricular purpose in the province. Bruner, J. S. (1966). Toward a theory of instruction (Vol. 59): Harvard University Press. The Constitution Act, 1982 (1982). Drucker, J. (2011). Humanities approaches to graphical display. Digital Humanities Quarterly, 5(1). Egan, K. (1978). What is curriculum? Curriculum Inquiry, 65-72. Foucault, M. (1984). What is Enlightenment? . In P. Rabinow (Ed. ), The Foucault Reader. New York: Pantheon Books. Freire, P. (1970). Pedagogy of the Oppressed (M. B. Ramos, Trans. 30th Anniversary Edition ed. ): The Continuum International Publishing Group Inc.
Giroux, H. (2012). 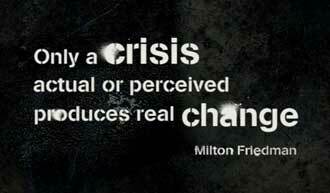 Education and the crisis of public values. Peter Laing, New York. Government, B. C. (2013b). 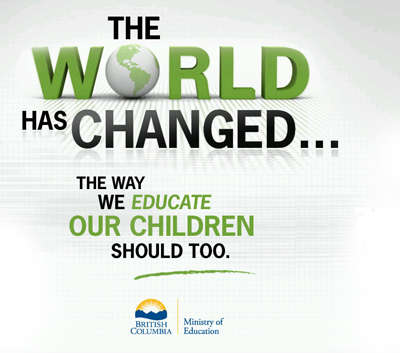 BC’s Education Plan Province of British Columbia. Groom, J. L., Brian. (2014). Reclaiming Innovation. EducausE review, Online. Harvey, D. (2005). A brief history of neoliberalism: Oxford University Press. McLuhan, M., & Fiore, Q. (1967). The medium is the message. New York, 123, 126-128. Perry, D. (2011). The Computational Turn: Thinking about the Digital Humanities. Culture Machine(Spec. Issue ). Shirky, C. (2008). Here comes everybody: The power of organizing without organizations: Penguin. Simsek, E., & Simsek, A. (2013). New Literacies for Digital Citizenship. Online Submission, 4(3), 126-137. Tyler, R. W. (2013). Basic principles of curriculum and instruction: University of Chicago press. Where the BCEdPlan runs just under 8 pages, the BCJobsPlan measures just fewer than 50. It is toward this ideal of enlightenment that we might apprehend the spirit of the Canadian Charter of Rights and Freedoms (Canada, 1982), or the Multiculturalism Act (Canada, 1988), which seeks “to promote the full and equitable participation of individuals and communities of all origins in the continuing evolution and shaping of all aspects of Canadian society.” While Egan notes that “one symptom – or perhaps condition – of pluralism is the conflict and argument about what [the] curriculum of initiation should contain,” it should not be controversial to state that the mandate of education includes an introduction to (and the rehearsal of) the requisite skills which promote this “full and equitable participation” in the creation of our collective societal narrative(s) and identity. This paper attempts to describe the nature of knowledge-creation in the Digital Age, and outline an approach to curriculum and citizenship that embraces an emergent sense of identity and culture. This view of knowledge is congruent with Simsek and Simsek’s description of the literacies required to actualize democracy in the digital era, which “differ from the previous ones, mainly due to their operational, interactive and user-based technological characteristics” (p. 129). Here we see that the emergent view of knowledge-construction, which presents a difficulty to institutional learning, may be supported by the advent of digital communications technologies. “If we hold that meaning is emergent,” Osberg and Biesta state. “Then the idea that educators can (or should) control the meanings that emerge in the classroom becomes problematic” (p. 316). Sidorkin admits that “the tragic side of such a situation is that regardless of teachers’ intentions the relationship cannot become equal and truly dialogical” (Sidorkin, 2000). Despite one’s best efforts, the context of organized learning assumes orientation toward certain aforementioned goals and/or outcomes. “The task of the dialogical teacher in an interdisciplinary team working on the thematic universe revealed by their investigation is to “re-present” that universe to the people from whom she or he received it – and “re-present” is not as a lecture, but as a problem” (p. 122). However this framework maintains the authority of the teacher to “re-present” the reality of students toward their emancipation and as such is deserving of Bruner’s critique (highlighted by Nahachewsky and Slomp) in that the student becomes a “performing spectator” who “does not invent the world, [but] uses it” (Bruner & Bruner, 2009). Sidorkin looks beyond this dialogical model toward Bakhtin’s idea of polyphony (Bakhtin & Emerson, 1993), and proposes that “the problem of imbalanced relation is not to be countered with power sharing based on considerations of equality.” Rather, he says, it should be “addressed with polyphony, the principle of engaged co-existence of multiple yet unmerged voices” (Sidorkin, 2000). The literacies attending such curricular intentions can be seen to revolve around the realization of a critical awareness of one’s community, and an ability to articulate a unique perspective within it. And it is here we see the notion of emergence begin to exist in a dual sense, as it arises in a collective narrative of community, but also in the individual’s sense of themselves within that community. “If students are allowed, through openness in the curriculum and their teachers’ language, to become part of a negotiation, facts then are created and become interpreted understandings shared by teacher and students, rather than transmitted by teachers as predisposed ‘truths’” (Nahachewsky & Slomp, 2009). “Many democratic values could be acquired by new literacies. New literacies are prerequisites for digital citizenship. New literacies increase the availability of relevant and credible information and broaden the capacity of individuals to get, share, compare, and contextualize information by developing new skills” (p. 133). While they are careful to not describe the revolution in communicative technology as a panacea in an era of anemic political engagement and accountability, the authors do note that such a summary of digital citizenship embraces the value of broad contribution to an emergent, collaborative constructed community. Optimistically, they note, “Digital citizenship could create a more transparent, connected and participatory democratic environment” (p. 132). “Identity in the digital territory is seen as a higher construct of literacies, which enables the citizen to act as a person with culture and independence as well as with critical abilities and democratic values” (Simsek & Simsek, 2013). When conceived of in this fashion, the society education serves intends to admit all voices in its chorus, and asks that schools provide learning in the conception and expression of individual and pluralist identities. This is a process that unfolds endlessly, as the One and the Many are constantly making each other (Follett, 1919), and it is toward this critical praxis that education must orient the student experience if it is to achieve Freire’s “critical and dynamic view of the world” by which we might realize what he considered the central human objective: “permanent transformation of reality in favor of the liberation of people.” The progress toward this pluralist aim is the stated purpose of the Canadian Constitution, and should guide the continued exploration of curriculum in the Digital Age. Bakhtin, M. M. M., & Emerson, C. (1993). Problems of Dostoevsky’s poetics: U of Minnesota Press. Bruner, J. S., & Bruner, J. S. (2009). Actual minds, possible worlds: Harvard University Press. Follett, M. P. (1919). Community is a process. The Philosophical Review, 576-588. Mitchell, D. (2008). Cloud Atlas: A Novel: Random House LLC. Nahachewsky, J., & Slomp, D. (2009). Sound and fury: Studied response (s) of curriculum and classroom in digital times. Beyond ‘presentism”: Re-imaginging the historical, personal and social places of curriculum, 139-151. Osberg, D., & Biesta, G. (2008). The Emergent Curriculum: Navigating a Complex Course between unguided Learning and Planned Enculturation. Journal of Curriculum Studies, 40(3), 313-328). Sidorkin, A. M. (2000). Toward a pedagogy of relation. [i] See Biesta and Burbules (2003), Biesta and Osberg (2007), Cilliers (1998) and Osberg et al. (in press). 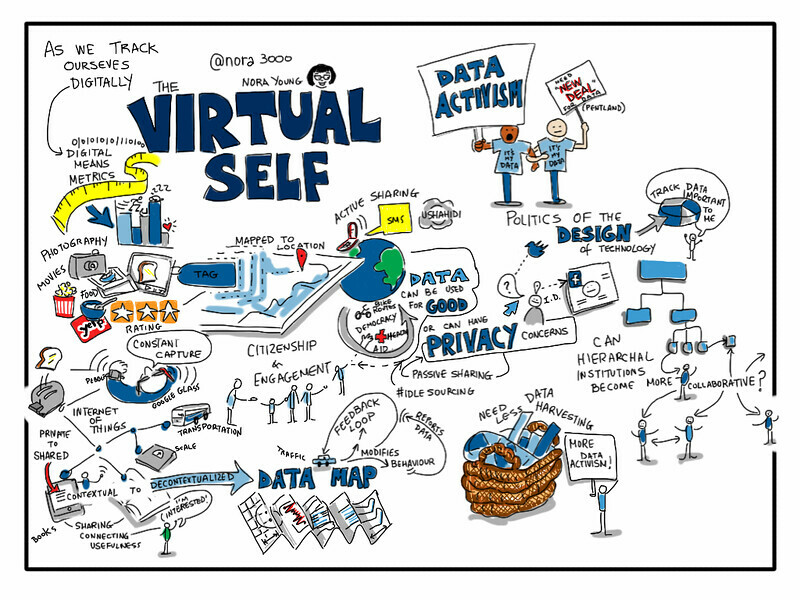 The Virtual Self, visual notes by Giulia Forsythe on a talk by Nora Young at Brock University March 2013 (Learn more about Giulia’s amazing Visual Practice here). What is knowledge in the digital age? How is it attained, where does it ‘live’? If in fact knowledge has changed, how should we go about teaching in this new era? And how do these shifts in knowledge and social processes affect the nature and purpose of citizenship? Andreotti, V. d. O. (2011). The political economy of global citizenship education. Globalisation, Societies and Education, 9(3-4), 307-310. Biesta, G. (2013). Learning in public places: Civic learning for the 21st century. Civic learning, democratic citizenship and the public sphere. Biesta, G. J. J. (2012). Doing Emancipation Differently: Transgression, Equality and the Politics of Learning. Civitas Educationis. Education, Politics and Culutre, 1(1), 15-30. Downes, S. (2012). Connectivism and connective knowledge: Essays on meaning and learning networks. National Research Council Canada, http://www. downes. ca/files/books/Connective_Knowledge-19May2012. pdf. Feldman, S. B., & Tyson, K. (2014). Clarifying Conceptual Foundations for Social Justice in Education International Handbook of Educational Leadership and Social (In) Justice (pp. 1105-1124): Springer. Garcia, J., & De Lissovoy, N. (2013). Doing School Time: The Hidden Curriculum Goes to Prison. Journal for Critical Education Policy Studies, 11(4). Howard, P. (2014). LEARNING COMMUNITIES AND DIGITAL CITIZENSHIP IN ONLINE AFFINITY SPACES: THE PROMISE AND THE PERIL. INTED2014 Proceedings, 5658-5658. Khoo, S.-m. (2013). Between Engagement and Citizenship Engaged Scholarship (pp. 21-42): Springer. Lentz, B. (2014). The Media Policy Tower of Babble: A Case for “Policy Literacy Pedagogy”. Critical Studies in Media Communication(ahead-of-print), 1-7. MacGregor, J., Stranack, K., & Willinsky, J. (2014). The Public Knowledge Project: Open Source Tools for Open Access to Scholarly Communication Opening Science (pp. 165-175): Springer International Publishing. Martin, C. (2011). Philosophy of Education in the Public Sphere: The Case of “Relevance”. Studies in Philosophy and Education, 30(6), 615-629. Monteiro, H., & Ferreira, P. D. (2011). Unpolite Citizenship: The Non-Place of Conflict in Political Education. JSSE-Journal of Social Science Education, 10(4). Queen, G., Ross, E. W., Gibson, R., & Vinson, K. D. (2013). I Participate, You Participate, We Participate…”: Notes on Building a K-16 Movement for Democracy and Social Justice. Workplace: A Journal for Academic Labor(10). Rice, J. (2013). Occupying the Digital Humanities. College English, 75(4), 360-378. Schugurensky, D., & Silver, M. (2013). Social pedagogy: historical traditions and transnational connections. education policy analysis archives, 21, 35. Sidorkin, A. M. (2010). John Dewey: A Case of Educational Utopianism. Philosophy of Education Archive, 191-199. Sidorkin, A. M. (2014). On the theoretical limits of education Making a Difference in Theory: Routledge. Talisse, R. B. (2013). Sustaining democracy: folk epistemology and social conflict. Critical Review of International Social and Political Philosophy, 16(4), 500-519. Willinsky, J. (2013). Teaching for a World of Increasing Access to Knowledge. CALJ Journal, 1(1). The title of this post, and its contents are synthesis and reflection of my thoughts while reading James Nahachewsky and David Slomp’s book chapter “Sound and Fury: Studied Response(s) of Curriculum and Classroom in Digital Times,” originally published in Beyond ‘Presentism’: Re-Imagining the Historical, Personal, and Social Places of Curriculum (2009). Nahachewsky and Slomp present the problem of how confronting these new realities of the digital age reveals a contradiction in that “digital texts, as created by young people become sites of action and agency [while] Arguably, brick and mortar classrooms are not.” The language arts, the authors note, are uniquely situated to reveal the particular opportunities such times present the study of pedagogy, as new media arise, changing the relationships between students, teachers, and even broader educative communities beyond our institutions. Using the shift brought to text by the digital age as a corollary, the authors begin to outline a structural transformation that is beginning to be seen in literacy education. Because while the governments of the western provinces strive toward a collaboratively determined common curriculum that will best prepare young Canadians for the digital and globalized 21st century, “The primary issue the Ministers [of education from Manitoba, Saskatchewan, Alberta, British Columbia, Yukon and the North West Territories] identified in the agreement was the need to optimize the limited resources of the provinces in improving education [emphasis from the original].” The point of view “imposed,” and which frames the narrative of educational reform contextualizes the task as one of necessity rather than aspiration. In other words, what is understanding? And what is it for? However as we look to the educative narrative presented in Canada today, we might note the Federal Harper Government’s discussions of scientific discovery have similarly limited its scope to invest “scarce resources” in research that offers a practical return on investment, thus affirming the broader cultural narrative of perpetuating an infinite growth economy as our highest purpose. As it is in education, the question To what end? is not included in the discussion of why we ought pursue scientific discovery (if not to achieve predicted economic outcomes), and the omission represents an abandoning of principles around which our cultural, social, artistic, political and moral traditions each originate and continue to revolve, those traditions which coalesced and were articulated during the dawn of the era of mass-printed texts. Following the invention of the printing press, Europe witnessed the transformation of its public sphere(s) (Habermas 1991), with paradigmatic shifts visited upon religion, politics, science, philosophy and the arts. The ability of greater and greater numbers of people to encounter and freely share new ideas delivered a cataclysm upon the singular narratives of public affairs constructed with absolute power by monarchs and churches, and is the overarching arc of justice which guides foundational schools of western philosophical thought to this day. Broadening the base of authorship in the creation of a collective narrative led directly to the transformation of the existent structures of the preceding paradigm. …must be of the strictest rigor. In the meantime, it is equally important that modern educationists explore and discover what can be, as it is central to the task of creating a fuller perception of nature and humankind which the traditions of metaphysics, epistemology, ethics and political philosophy demand of us. Maria Montessori presents a critical consideration of the “New Pedagogy” (1912) by discussing the advent and implementation of the “scientific pedagogy” that took root in Italy around the turn of the 20th century. Montessori’s critique focuses on the shortcomings of scientific pedagogy to address the human subjects (and observers) involved in the study of teaching and learning. In establishing her critique, Montessori finds fault with an overemphasis on the instrumentalization of pedagogy which comes at the expense of a more authentic manifestation of the spirit of learning. This spirit of learning is connected throughout her argument as part of the same pursuit of knowledge that has sustained human progress since the beginning of civilization. She cites examples of rigid student desks and behaviourist means of doling out rewards and punishments as elements of “scientific pedagogy” that run counter to the spirit of discovery that is central to learning. For a new pedagogy to emerge within this context, Montessori argues that teachers ought to be prepared to engage the act of teaching as one oriented toward “a conquest of liberty” that provides an education in which pupils are seen as future agents of human regeneration. To this end, she proposes educationists elevate the study of pedagogy to that of its own scientific exploration: part of the larger narrative of human progress that is embedded within the histories of science, technology, and the broader humanities, and yet informed by its own unique contexts and possibilities. In conducting an inquiry into curriculum, the black box may prove a useful metaphor to consider possible avenues of discussion or research. In his essay What is Curriculum? (pdf) Kieran Egan introduces Cicero’s use of the Latin curricula “to refer to the temporal space in which we live; to the confines within which things may happen; to the container, as opposed to the contents.” By applying the metaphor of the black box, we can appreciate the discussion of curriculum as being concerned with educational inputs and outputs, and the black box itself representing the individual experience of the learner. With the advent of Enlightenment philosophy, society began to orientate itself toward the actualization of a pluralism that assumed an infinite diversity of human minds; here we see the shift of inquiry away from inputs and outputs, and toward the nature of the black box itself. And so we find ourselves surrounded by curricular initiatives that describe at exhaustive length the hows of learning in the 21st century: game-based, play, outdoor, experiential, collaborative, critical thinking, and various apps, hardware, and learning media aggregate to serve a purpose that is discussed as a forgone necessity. Notions of what should be taught are often presented in platitudinous photo-opportunities operating within the premise that the future will so paradigmatically different from the present or past that any discussion of curricular contents can only be looked upon with the most pragmatic or utilitarian perspective. In building the altar of how, the means of delivering curriculum have become the ends: we have become singularly focused on what education must be in favour of what it might become. 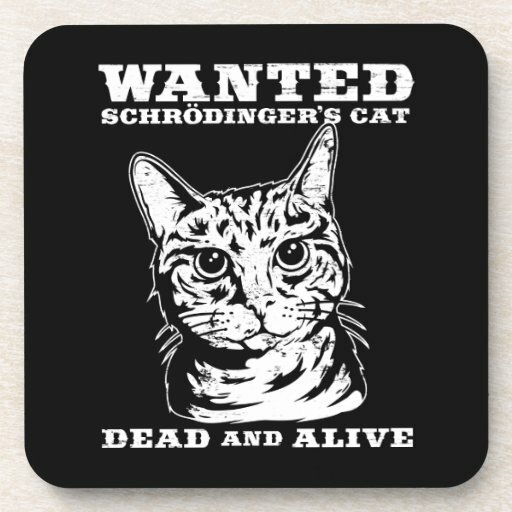 In considering curriculum as a black box problem, we might be guided by Schroedinger’s cat thought-experiment. Originally conceived to highlight the paradox at the root of quantum mechanics (basically the uncertainty principle), a simplified look at the analogy finds Schroedinger’s cat inside a black box with a vial of poison that will alternatively be delivered, or not, depending on the state of a subatomic particle. Until the box is opened, there exists potential for either eventuality to exist: that the cat is still alive; or that it has expired. And so until a definitive measurement or observation can be made, the cat might be thought of as being both alive, and dead. In resembling the black box, our discussion of curriculum traverses the knowable entities of inputs and outputs, and seeks to investigate the opaque nature of individual experience. In this inquiry, as soon as measurement and observation are able to record new points of knowledge they unfold into new inquiries toward an ever-retreating horizon.